"Bobby's" search for a 1959 Indian Trailblazer like the one he had at age 16 led me to ask if he had a snapshot of his original motorcycle. "Sad to say, but NO, I don't have a single snapshot of the bike! At that stage of my life I'm pretty sure it was just something I didn't even give a thought about. Funds were short back then and if we had a camera, I don't remember it." Bobby is the fellow who advertised on CraigsList in Nashville, Tenn., offering cash for a 1959 Trailblazer. 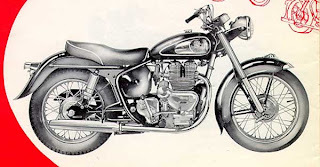 This was a 700cc Royal Enfield twin, badged as an Indian and sold in the United States. "That bike was probably my second or third in a LONG line of bikes up to today, but yet, it seems to bring back such a flood of memories!" he told me. "I was about 16 years old and didn't have any money to speak of, so most of my 'fun' came from riding my bike (gas was 18 cents a gallon) with a friend who also rode (K-Model Harley). "In those days you could ride for countless miles and never see another bike, so having a riding buddy was a good thing! We became friends when he stopped to help me after my Cushman Eagle decided to take a dump on a country road a long way from home. "The Eagle was my first real powered two-wheeler and it was a pile of junk, but I didn't care. It gave me a measure of independence and I loved it. Swapped a go-kart for the Cushman. I'd bought the go-kart with money I made from selling Coke bottles that I picked up along the road (3 cents each if they were COKE brand, 2 cents for all other brands)." "I located the man that bought the bike from me and he simply can't remember what he did with it! He's almost 90 years old now and I completely understand how that can happen. He has assured me he will contact me should his memory of the bike return. "The search for 'it' has become known among my friends as my 'HOLY GRAIL' folly, nonetheless I will continue to seek." If you have a 1959 Trailblazer that needs a good home, contact Bobby at the email address in his ad. My father owns a 1958 Royal Enfield Indian, email him @ daytradar@aol.com for info.